After showing in theaters in front of Iron Man 2 this past weekend, Paramount has debuted the teaser trailer for J.J. Abrams' secret alien project Super 8 online via Apple. I've already seen the trailer (in theaters) and I think it's a fantastic introduction and perfect tease. I'm glad it doesn't show more than this. I only wish this was the only trailer we get until the movie hits theaters. I'm hoping Abrams keeps most of the plot a secret. I hate how trailer these days give way too much away before you actually see the movie. Anyway, if you haven't seen this trailer, you should definitely check it out. Super 8 (which is supposedly a tentative title) is written and directed by visionary director J.J. Abrams, who started his career with "Lost" & "Alias" before directing Mission: Impossible III and Star Trek last summer. This is being produced by Steven Spielberg with a budget of ~$50 million and it hasn't even started shooting. Abrams will film this in the next months, most likely in complete secrecy, so I'm not sure when we'll see the next trailer. This is supposedly inspired by Spielberg's films of the 70's and 80's. Paramount will be releasing Super 8 in theaters everywhere sometime next summer in 2011 (a date has not been set). It's pretty unusual for a brand new trailer to be released just days before it hits theaters. Not quiet sure why Universal decided to go with it. Maybe it's because it hasn't received the best reviews and they wanted to give one more shout out? I hear the movie ends right when the real tale of Robin Hood begins. Hmm... Anyway, here is the brand spanking new trailer for Robin Hood which you can watch via Hulu below (that means only US viewers). I'm seeing Robin Hood this weekend and will keep you posted as to whether or not it's any good. Enjoy! 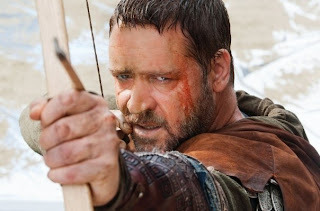 Follows Robin (Russell Crowe) from his early days in King Richard's army to his return to Nottingham to his creation of a band of mercenaries who challenge the sheriff and eventually try to prevent civil war. Robin Hood is directed by British filmmaker Ridley Scott, of many classics like Alien, Blade Runner, Black Rain, G.I. Jane, Gladiator, Hannibal, Black Hawk Down, American Gangster, and many more. The script is written by Oscar winner Brian Helgeland, of L.A. Confidential, Conspiracy Theory, Mystic River, Man on Fire, Green Zone, and more. Universal is bringing Robin Hood to theaters this Friday, May 14th. What movie interests you more? Seriously sat there with my mouth hanging open with that Super 8 trailer. It'll probably be an R though. So I'll depend on others tot ell me how awesome it is. Crowe is a good choice for this more brutal version of RH. And Cate Blanchett is divine, as ever. Can't wait to see it!